On Friday 17th of September we represented the openSUSE community to a general speech organized by GreekLUG about FOSS at a elementary school at the center of Thessaloniki. The speech was on Friday because on Saturday schools are closed. The audience were teachers, parents and of course kids (ages from 9-12 years old). We had to do the same speech to 3 different classes. A representative from GreekLUG talked about what is FOSS and what are the benefits of using it. 1. Distribution that is the leader of technology. 2. 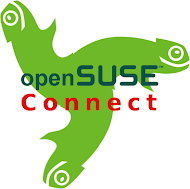 Large community around the world that develop the operating system but also help people to use openSUSE. 4. There are many versions that everyone can use depending the needs. 5. There is educational software for the kids. Teachers and parents were asking about safety that openSUSE can provide them for their kids and how openSUSE can be used in education. Efstathios Iosifidis provided PromoDVDs, stickers and also a brochure with Greek Help. We gave 100DVDs, about 40 stickers and many brochures. We couldn't use only our Promo material since it was GreekLUG event for Software Freedom Day. But Kostas promoted openSUSE to everyone. Αυτή η εργασία χορηγείται με άδεια Creative Commons Αναφορά προέλευσης - Παρόμοια Διανομή 3.0 Μη εισαγόμενο . openSUSE Greek Community. Από το Blogger.